1999′s The Mummy remains the best archaeology-themed adventure movie since Raiders of the Lost Ark. The sequel was a disaster, but THE MUMMY RETURNS had had some worthwhile elements. This version carefully digs them out. One warm summer day in 2001, I staggered into my Northern California house. I was nearly fifteen, and had just seen The Mummy Returns, the sequel to my second-favorite film, in a nondescript multiplex where the suburs bleed into the countryside, and the shimmering inland heat had made the car ride back an almost otherworldly experience. While an unusually loud sound system and the spectacle-filled extravaganza had, in conjunction with my considerable anticipation, somewhat dulled my senses, I was dimly aware that the film I’d just seen was not very good. The plot was underthought and often baffling; indeed, one dead character from the first film had somehow been resurrected before the events of the second, and with no explanation whatsoever. While some humorous moments (particularly in the film’s first half) recalled the sly self-referentiality that still makes its predecessor a lively watch, an alarming number of the jokes had fallen flat. And while the sumptuous costumes, majestic score and enchanting scenery had made for a thrilling cinematic experience, there had simply been far too much action that added little to the story or themes. (The celebrated film critic Roger Ebert agreed, writing “Imagine yourself on a roller coaster for two hours. After the first 10 minutes, the thrills subside.”) Still, while all my friends agreed with the popular consensus in labeling the film a disaster, I knew that the picture had had some worthwhile elements. Maybe someday, I thought, I could take to a computer and dig them out. Throughout the following years, I never got that opportunity, and though I tried revisiting the film on several occasions, I only became increasingly dismayed by the experience. Still, once or twice a year, I’d take wistful looks at screenshots collected online, and gradually memorized the complete sequence of scenes. I even came up with a favorite theory as to how the aforementioned reincarnation had occurred. My ambition to someday make a fan edit of my own never entirely subsided (indeed, I also found another film I wanted to redact almost as badly 1985′s Weird Science), but until the summer of 2008, I continued to view any practical possibility of such an effort being at least a few years away. Thanks to the terrific folks of the Fan Edit Forum, however, my dream of eight years has been realized. It is therefore my honor to present to the fan editing community (and anyone who owns a legitimate copy of the theatrical cut) the result, The Mummy: Year of the Scorpion. Removed all references to Evy being a reincarnation of a long-dead princess. No, she isn’t. Numerous trims to the fight in the manor. Removed all references to Rick being a Medjai. This subplot had potential, but it’s superfluous. Shortened Imhotep’s reincarnation. Rick and Ardeth don’t encounter awkward mummies in the British Museum, and they certainly don’t watch the rites without making any effort to stop them. Various trims to the Museum sequence. Alex doesn’t talk about the golden pyramid’s diamond, Jonathan isn’t such a slobbering coward and the shootout is shortened. The bus chase has been almost entirely excised. It didn’t move the story forward, and we’ve already had a lot of action. We never see the painfully unfunny motley thugs alive. Who cares? Various trims to make Izzy less annoying. Rick no longer threatens to shoot him. Cut the twelve tribes of the Medjai. No way were there that many of ‘em! Cut Ardeth’s silly bird in all but one shot. Meela’s transformation into Anck-su-namun is now uninterrupted, and it’s in aged grayscale. Alex no longer makes sandcastles; he merely draws maps. The wall of water has been heavily reduced. Ardeth doesn’t hold his sword to Jonathan’s throat, nor does he talk about Anubis’ army. Numerous cuts to the pygmy attack to keep the story moving as quickly as possible. Rick doesn’t outrun the sun. Evy doesn’t die, nor does she get reincarnated and fight Anck. Jonathan doesn’t fight Anck either. The Medjai don’t fight the warrior-dogs… at all. The Rick vs. Imhotep fight is drastically reduced. Most of the close-ups on the CG Scorpion King’s face have been removed. The entire collapsing oasis scene is excised. Ahm Shere survives! Heavy cuts to the denouement. The credits are now greyscale. The title specifies that it’s an edit. Appended a Mummy 3 “best moments” reel. I don’t have enough to say about this movie to write an essay. I saw it once in the theaters and all I remember is the horrible CGI and parts of the finale set piece. This edit was a good little flick, intentionally cheesy without being too terrible, some fun action, good lines, etc. Title cards were a nice gimmick. There were quite a few jarring audio cuts. If you’re a fan of the first movie I think you’ll enjoy this edit. A good edit. There are some “rough” areas that are noticeable but don’t really detract from the overall viewing. I especially liked the “film restoration” style of this edit. Gaith took the worst part of this movie (the opening with The Rock) and made it a fun, classic horror movie part (much like the original 1930′s “The Mummy”). Gaith might have over-used the “damaged film” look a little too much in the opeing and there is a very rough edit/cut/transition to the main movie at this point, but overall it is a great start to a mediocre movie. The fade in and fade outs are a little too long (while dialogue has started or is still going as the fade starts/stops), but gain not so long as to seriously detract from the edit. I DL’d the DVD version and the overall quality is good (4 out of 5), audio is good too (4/5). 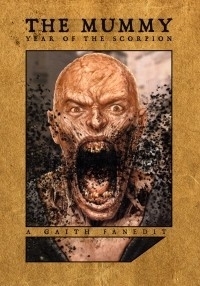 Gaith has taken, for me, a very disappoiting film and made it a much better experience. I have a feeling others might take issue with the drastic reduction of “action”, but for me, it was what was needed. Honestly, I get very bored with long action scenes. I am glad Evy the re-icarnation plot references are gon as well as the too long Pygmy attack scenes – without the long-winded pygmy scenes, the movie becomes MUCH more quick-paced without losing plot. I commend you for removing the annoying Evey reincarnation and Rick Medjai subplots and other such annoyances. However, I don't feel that your version managed to make "The Mummy Returns" into a better movie. There are too many annoyances to remove, and despite removing many flaws, your edit felt like it somehow made the remaining ones seem even worse. Also, there were too many noticeable cuts, which caused the editing to feel sloppy at many points. While I like what you tried to do with this edit and feel that some of your changes were improvements, I feel that overall, it didn't work well. I, like you, consider "The Mummy" (1999) the best archeology-themed adventure movie since the original Indiana Jones trilogy, and its sequel far inferior to it. However, while you did remove some of the flaws of "The Mummy Returns", I am sad to say that I enjoyed your edit even less than the original movie.